I was on the water the other day and had a thought....Why not buy a steel barge from Holland as done on Grand designs and then build A Helsinki Log cabin on the deck. I think it would be a Grand sdesign worth seeing. Not only would the hull provide additional accommodation but the Helsinki itself has four rooms for living in. If anyone out there thinks its a good idea and would like to do it contact the Cabin Living team because we would love to build it. 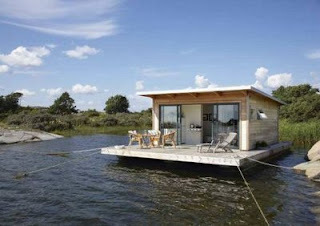 I'm not sure what the barge itself would cost plus the mooring but the cabin is around £10,000. 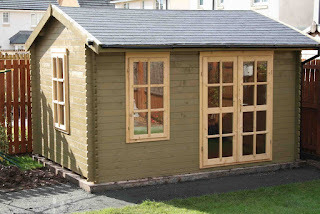 We can even fit the kitchen and bathrooms as well as the log cabin. It could be a very in-expensive way to have a luxury home close to London. There must be someone out there who would like to try it or even someone out there with a barge and a mooring for sale that may be interested in selling to us. Recently I believe there was an article on GMTV about moving someone into a log cabin in your garden. Ofcourse this sounds like a great idea but there are some complications. At Cabin Living we focus on providing cabins ideal as an office, or as extra rooms for your family to grow. You could easily have someone round for a sleepover but if it becomes permanent accommodation you enter a different ball game. If you visit the planning portal it states "ancillary to the main home" meaning an extra you could live without and also states "with no sleeping accommodation". 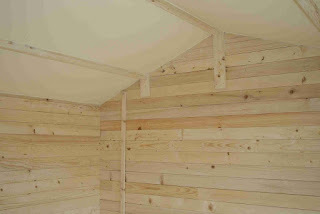 So if you are planning on moving your son or daughter into a log cabin you will need to seek planning permission. Secondly if you are going to move into your cabin you will need connection to mains services. This is where building control come in. You will need building control approval for all service connections to ensure they conform to current regulations. Finally as your cabin will be permanent accommodation building control will have an interest in the insulating capacity (part L1 A of building regulations for new build)and proposed heat source for your cabin. This is called the SAP (standard assessment procedure) rating. The first step is to contact an architect who can take the drawings of your proposed cabin and present them to your local planning department as part of a package covering issues such as fire escape etc. An architect would also be able to advise of the most appropriate solution for connection to sewerage and other services. Finally the architect should be capable of liasing with building control to ensure your log cabin meets the necessary SAP rating. There are cabins available that are designed to meet the SAP rating but they will still need approval form your local council. So you've built your log cabin. What else do you need to do? 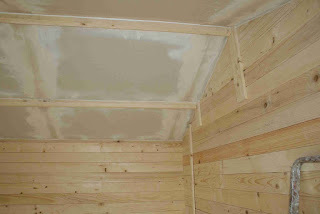 Well...It is really worth considering adding additional insulation to your roof space when you've built your log cabin. This serves two purposes. First of all it helps to keep your log cabin cosier in winter. Finnforest appear to have done some research into this and point out that the roof and floor account for 70% of heat loss. Secondly and perhaps not so obvious roof insulation helps to moderate the heat absorbed by the roof so that your log cabin temperature doesnt soar as high as a conservatory for example. At Cabin Living we fit rockwool slabs, though we can fit the foil backed airtec system if you prefer, and then cover this with plaster board. Here we see the process almost complete with the second layer of filler on the tapered edge boards recently applied. Then all that remains is to tidy the edges and paint. There is likely to be some movement between the roof and the walls so after a while it may be necessary to apply more decorators filler at the edges or alternatively you could fit beading to the ceiling in effect a cornice which would float up and down with the ceiling. We will look at a few of our other options next time.